Browse carom-seeds suppliers by country and region. Spices like dry red chillies, black cardamom (ellaichi), fenugreek seeds (methi), aniseed (saunf), asafoetida (heeng), black pepper (kali mirch), carom seeds (ajwain), coriander seeds (dhaniya), cumin seeds (jeera), dry ginger (Sonth), dry mango. Turmeric powder, coriander seeds, cumin seeds, natural sesame seeds, carom seed (ajwain), fennel seeds, psyllium husk, fenugreek seeds, potato. Short on time? Let carom-seeds sellers contact you. Carom seeds, betel nuts, cardamom, liquorice and rock salt. Industrial chemicals and agro commodities like ; cumin seed, turmeric finger / powder, red chili powder, coriander powder / seed, black eye beans, black mustard seed, black pepper, fennel seed, fenugreek seed, asafetida, black kalonji, cinnamon, carom seed, pulses. Coriander seeds, cumin seeds, nigella seeds, poppy seeds, fenugreek seeds, sesame seeds, aniseed, carom seed and all spices and herbal products. Pulses, spices like turmeric powder, cinnamon, dry fenugreek leaves, coriander seeds, cumin seeds, carom seeds, dried pumpkin, water melon seeds, fennel seeds, fenugreek seeds, mustard seeds. Ginger, sour mango powder, carom seed, Indian gooseberry, pomegranate seed, green cardamom, mango extract, cinnamon, coriander seed, coriander powder, cardamom, spice mixture, unrefined sugar (jaggery), turmeric, coriander, myrobalan chabulic, asafoetida. Onion, potato, coconut, tomato, garlic, black pepper, turmeric, fennel seed, coriander seed & powder, carom seed, cumin, ginger, coir product, paper plates, areca leaf products, rice, wheat, barley, sorchum bicolar, pearl millet, maize, pigeon bea, horse gram, coconut charcoal. 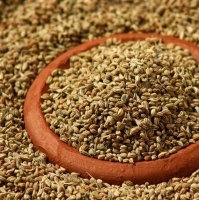 Indian seeds and spices like pepper,lly deal in flax seeds, cumin seeds, fennel seeds, carom seeds. Black pepper, green cardamom, cloves, coriander seeds, cumin seeds, fennel seeds, nutmeg, nut mace, dry ginger, turmeric, cinnamon, mustard seeds, fenugreek seeds, dry red chillies, carom seeds, sesame seeds, non basmati rice, basmati rice. Anukul Chandra Foods Pvt. Ltd.
Cumin seed (jeera), carom seeds (ajwine), fennel seeds (souff), dill seed (suvadana), sesame seeds (tilly), mustard seeds (rai), split coriander seeds-(rosted and salty) (dhanya dal) and coriander seeds (dhanya)..
Agri products like wheat, cashew nuts, carom seeds, parboiled rice, organic chick peas, peanuts, moringa leaves, fresh organic vegetables, A4 paper.